There was a challenge thrown down on YouTube called The Great Chili Confrontation. I’m usually up for a challenge but there were a couple of problems. First, what chance does a fat old Canadian have against all the great Chili makers in the US? What the heck! I’ve embarrassed myself before. Second, If I was going to enter, I would have to go all in which would mean it wouldn’t be a quick simple cook. I would have to pull out a lot of tricks to layer in flavour to have any chance. Well, I am retired but I’m busy. Finally, I decided I had to defend the honour of all fat old Canadians. First, I wasn’t going to go to hamburger for my meat. It just doesn’t have enough flavour and texture. Instead, I picked up a nice 2 pound cross rib roast. Tough but it has a lot of flavour. I injected that into every inch or so around the beef. I put the meat in the fridge, uncovered, overnight for the surface to dry and the rub to set. Another way of adding flavour to beef is to smoke it. So I preheated my smoker to 230 F and put the meat in. I smoked it to an internal temperature of 140 F, about 3 hours. If you don’t have a smoker, you can do this in an oven and it will still be tasty. I brought the meat in and put it in a roasting pan and added 250 ml (1 cup) of beef stock. You can’t have enough flavour! I covered the pan with foil and put it in a 230 F oven and cooked the beef to an internal temperature of 203 F, about 3 1/2 hours. I let the beef rest under the foil for 2 hours. I took the beef out of the pan and pulled it into shreds, discarding any large pieces of fat. I chopped the threads to about 1/2 inch lengths. I put the juices from the roasting pan in a clear container and used a poultry baster to pull the liquid from under the fat that floats to the surface. I added the juices to the beef. More flavour! It was late so I put the meat in the fridge overnight but there is no need for this if you want to carry on making the chili immediately. I could use some oil to saute my onions but why not add more flavour? I sauteed 125 ml (1/2 cup) of chopped bacon over medium heat to have it rend fat. When it was starting to colour, about 5 minutes. I added 375 ml (1 1/2 cups) diced onion and sauteed until it was getting translucent and soft, about 4 minutes. Living in the Canadian Rockies, I don’t have access to great chile peppers. So, I have to go with canned. I drained a small 118 ml (1/2 cup) can of chopped green chiles. I opened a can of Chipotle Jalapenos in Adobo sauce and chopped enough of the peppers to make 40 ml (3 tablespoons), making sure to get lots of the adobo sauce in with them. I chopped 2 cloves of garlic. I added the peppers and garlic and stirred for 30 seconds. I added my seasonings, 15 ml (1 tbsp) chili powder, 5 ml (1 tsp) dried rosemary and 5 ml (1 tsp) dried thyme. Stir for just a few seconds. The fumes will be really strong! Reduce the heat to simmer and cook, uncovered, for 1/2 to 1 hour until the mixture is thick and rich. Add 15 ml (1 tbsp) of molasses. Taste and adjust seasonings. Put a 540 ml (19 oz) can of kidney beans in a colander and rinse them off. Add them to the chili. Cover and simmer for 1/2 hour. If you like, serve with grated cheese and onions to sprinkle on top. Here is the video I entered in the confrontation. I hate to blow my own horn but this is wonderful chili. There are the normal tomato, chili tastes but it is layered on incredibly tasty beef that lends a richness to the sauce. 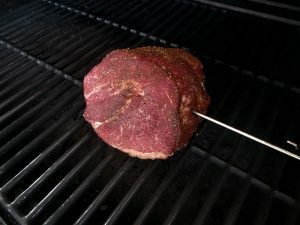 The chunks of smoke beef are delicious and add a wonderful texture. There is an nice heat that sneaks up on you but doesn’t burn your tongue. 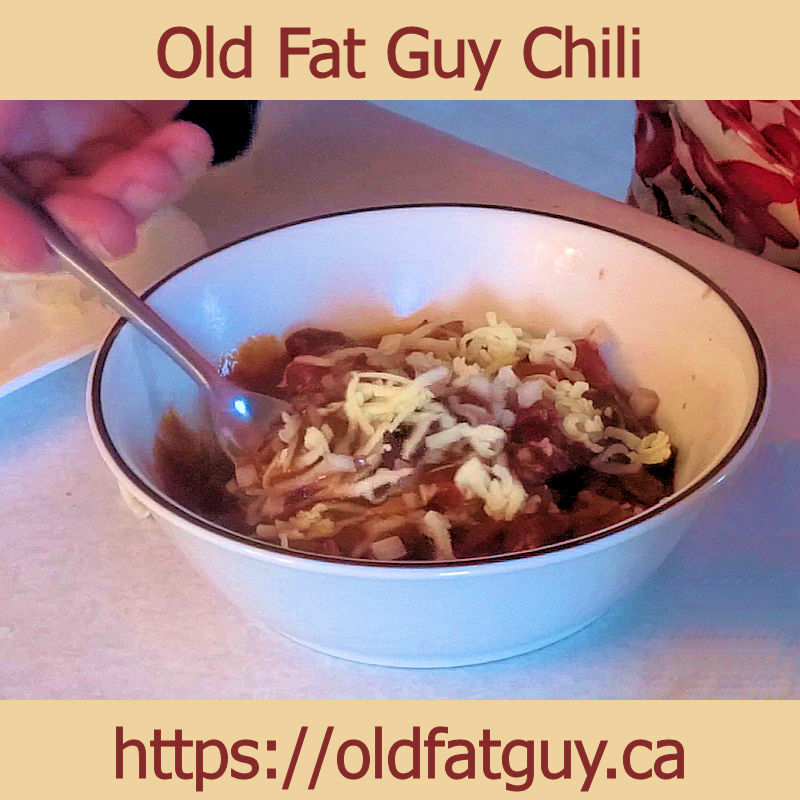 If you want a complex, meaty, delicious chili and are willing to do a little extra, this is the recipe for you! Here is the video for the contest! 118 ml (1/2 cup) canned diced green chiles, drained. Mix the beef stock, soy, Worcestershire and chili powder together. 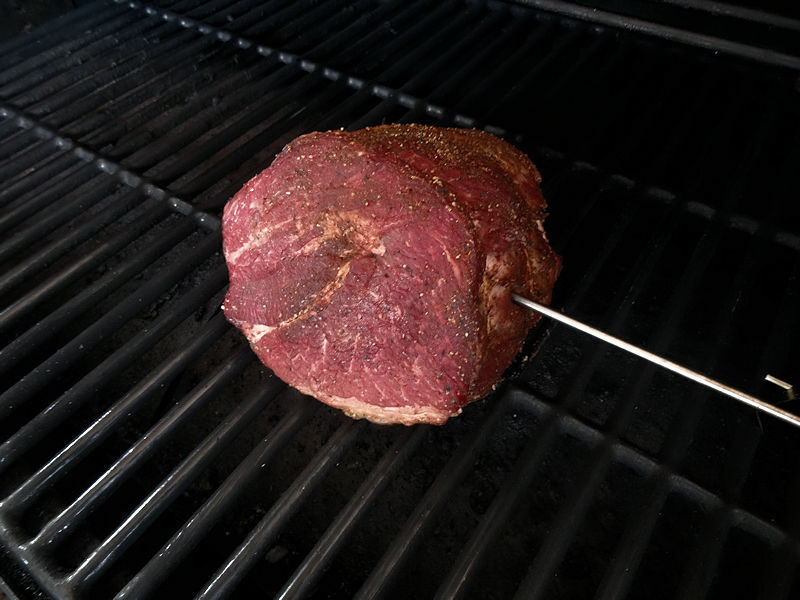 Inject every inch around beef roast. Mix salt, pepper, onion powder, garlic powder, and chili powder together. Rub it over the surface of the roast. Put the roast in the fridge overnight, uncovered. Preheat your smoker or oven to 230 F and cook to an internal temperature of 140 F.
Put the roast in a roasting pan and add the beef stock. Cover with foil and cook in a 230 F oven until the internal temperature is 203 F.
Let the meat rest in the pan for 2 hours. Shred the meat by hand, removing any large pieces of fat. Put the juices from the pan in a clear vessel and pull the liquid from under the fat with a turkey baster and add them to the meat. In a pot over medium heat, saute the bacon until it starts to colour. Add the green chiles, chipotle in adobo and garlic. Saute for 30 seconds. Add the chili powder, rosemary and thyme. Saute for 5 to 10 seconds. Add the diced tomatoes, tomato sauce, tomato paste, soy sauce, beer and the cooked meat with the juices. Reduce heat and simmer uncovered for 1/2 to 1 hour until the sauce is nice and thick. Add the molasses. Taste and adjust seasonings if desired. Add the kidney beans and simmer, covered for 1/2 hour. If desired, serve with cheese and chopped onions for topping. What a great combination of meats for a chili. I wouldn’t have thought of adding Italian Sausage. The grilled chicken would give a different texture to. I like sour cream on my chili but She Who Must Be Obeyed has pointed out it isn’t good for me!